Ever wanted an organizer that ran Windows 2000? A way of squeezing your laptop into a coat pocket? It has been 2 years since Toshiba pulled out of the Sub-notebook space in North America, but these tiny machines have remained popular in the Asian markets. I never really appreciated why anybody would buy a notebook with a small screen, small keyboard, and no drives, until I spent a very hot August in Tokyo. As I travelled in the sweltering heat of the subways from one appointment to the next, my briefcase started to feel like a lead weight. That's when I first dropped down to Akihabara to take a look at the variety of tiny notebooks on display there. Toshiba's Libretto wasn't the only game in town, there were excellent sub-notebooks by Panasonic, NEC, Fujitsu and Sharp. All of them weighed just about 2 lbs, and all of them ran a full Windows/Linux OS. These sub-notebooks are now available in America, thanks to Dynamism. For the last several years Dynamism has specialized in importing laptops directly from Japan, and they have built an enviable reputation within this specialized sector. Dynamism supplied BYTE with one of the new Libretto L1 units for review. 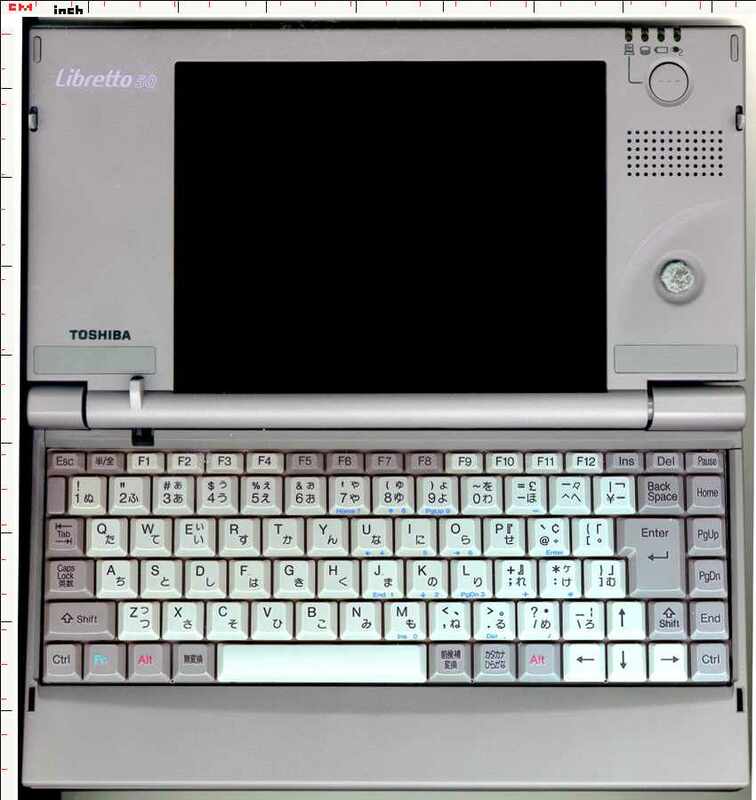 For many years Toshiba's Librettos retained the same tiny form factor. The Libretto 20,30,50 and 70 all fitted into the same 8.3" x 4.5" x 1.3" footprint. However, the screen of the L1 is a healthy 1280x600 pixels, and all my usual applications displayed correctly, with no scrolling or squeezing required. The classic Librettos were 640x480 and the VAIO is 1024x480. Getting decent menus to display in only 480 pixels of height often takes a little judicious juggling. The L1 no longer has that limitation. I am a luddite when it comes to my work tools. I design computers, and, although I love new technologies, I know their limitations only too well. I purchased my VAIO with a 400 MHz Mobile Pentium II soon after the new Crusoe-based VAIO's became available. No newfangled CPUs for me, thank you! But I made a mistake - the Crusoe is an excellent CPU. The early Librettos did not have a secondary SRAM cache, and were too slow to display videos. So I loaded up a sample 720x480 Windows Media video into WMP 6.4. It played without any jerkiness, and 'properties' reported no frames had been lost in the renderer. The video accelerator chip in the L1 announces itself as "S3 Savage/IX", and it obviously works well. How Compatible is the Crusoe? I have been looking at the reviews of Crusoe-based laptops for nearly a year now, and have gotten sick and tired of reading how this benchmark or the other benchmark shows some sort of limitation or another in the Crusoe's architecture. I settled on using FlaskMPEG, a utility that converts MPEG 2 video files to MPEG 4 (and other streaming formats). At the same time it converts the 48Kbps audio to 44.1Kbps rates and resizes the 720x480 interlaced input video to 352x240 progressive scan output. FlaskMPEG typically takes about 12 hours to crunch a 5 gigabyte file into a smaller (600 MByte) version. When it is figuring out the Discrete Cosine Transform of the MPEG data stream, FlaskMPEG uses MMX intructions extensively. Indeed, parts of it are hand coded in MMX assembler. It also does bicubic video transformations and a host of other integer and floating point calculations. And quite a bit (5.6 gigabytes) of file I/O. The measured computation speed is expressed in frames per second (fps). The incoming NTSC video is 30 fps, but the software runs a lot slower than real time. I decided to use my old 600 MHz P-III Video Monster for the reference machine. This has 64 meg of 100 FSB DRAM, 7200 rpm disks, and is nearly 12 months old. Fairly representative of the average desktop computer. FlaskMPEG cruched along at 6.06 fps with this setup. My 400 MHz P-II VAIO PictureBook C1XS achieved 3.75fps, with the CPU set for full battery saving (the only way I use it). The 600 MHz Crusoe in the Libretto L1 got 4.07 fps when set in performance mode, 2.53 when set up for optimized battery drain. Quite an amazing performance really. Especially since the MMX instructions constitute a significant portion of the total execution time. They are obviously emulated quite well by Transmeta's 'Code Morphing'. Of course, you would be disappointed in BYTE.com if we had not managed to 'break' the review machine. It was hard, in fact I was very impressed that it had not broken with FlaskMPEG, so I had to dig around a little deeper into the innards. The breakthrough came while I was looking at the Crusoe's memory interface, using a neat tool called "MemTach", written by William Henning, the editor of CPUReview.com. This bombed out most effectively (with an access exception) whenever 'prefetch' was enabled. By telling MemTach not to 'prefetch' it could be coaxed into moving past the exception and producing data. I suspect that prefetch is achieved by 'poke'ing around in the cache control registers, and Crusoe can't really be blamed for not emulating the Pentium to that degree of detail. Or can it? It surely wouldn't take too much effort to catch all those special Pentium instructions and harmlessly turn them into NOPs? Fill measures the memory fill rates for double/int/short/char data types using optimized C code. Sum measures the rate at which optimized C code can sum up a very large vector; note that the double result alsoinvolves a floating point operation for every double accessed. Random int estimates random memory access performance. Analyze measures the time taken to access bytes of memory under circumstances designed to torture test the memory subsystem. Those of us who optimize in assembler will note that the trick of using a double precision FP instruction to move 64 bits in one chunk works well on the P-III, where the sum returned a healthy 891 MBytes/sec, while the Crusoe only managed a lethargic 316. The Crusoe is, however, more symmettric in speed as we fetch ints, shorts and chars. This should be no surprise to anyone who has studied how Crusoe's 'Code Morphing' works, and it is a credit to the Crusoe designers that I am having to dig so deep trying to find things that this chip doesn't do so well. Crusoe is indeed a very impressive technology. OK, since we have now decided that the Crusoe is a good choice for the CPU, let's look at how Toshiba has chosen to package it. I used EZDVtest to check the speed of the Toshiba MK3017 30 Gigabyte hard drive fitted to the L1. Read and write speeds were good, at 19 and 18 MBytes/sec respectively.This compares with 12 and 13 MBytes/sec for my VAIO, which has been upgraded with a 20 Gigabyte IBM Travelstar. These small laptop drives spin at only 4200 rpm, rather than the 7200 rpm now standard on the desktop, and are somewhat slower as a result. Considering the overhead involved in the Code Morphing software, 20 MBytes/sec is very respectable number, plenty good enough even for the most demanding mobile applications. There are two USB 1.1 sockets. No floppy came with the demo unit, but the USB floppy from my Sony (an OEM YE-Data drive) worked fine. Having the extra socket, I was able to use my Targus USB optical mouse. An external mouse is an essential accessory for the L1, since, for some unknown reason, Toshiba has replaced the brilliantly innovative mouse button used in the older Librettos with a standard push stick, inconveniently place in the middle of the keyboard. The IEEE 1394 port uses a Texas Instrument OHCI compliant host controller and the smaller style of camcorder-compatible connector. The external monitor connector is not DB15, but a pesky external adaptor is needed to interface from the tiny socket on the L1 to the DB15 on the monitor cable. Something else to carry around and lose. Sony has the same system, I wish they would take the extra effort to install a standard size video plug. The keyboard uses a Japanese layout, very similar to a standard keyboard, but with subtle differences. But then, it's hard to find a laptop these days that doesn't have some geeky, newfangled, placement of keys upon it. 128 MByte of SDRAM comes standard, and Windows reports that 114,114 KBytes are available to the OS (some is used by the Code Morphing cache). The audio input connector is for a MONO microphone. Why does Toshiba not put a stereo input on a machine such as this? If they think a mono microphone is adequate why don't they use the same 2.5 mm plug which has become the standard for cell-phone hands-free adaptors? So how am I supposed to record Stereo audio with this machine? Using the iLink connector? There is a very convenient manual volume control near to the speaker, a great help when the machine starts beeping at you during an important meeting. No Infra-Red interface is provided, but there is an internal WinModem. There are 10 selectable screen brightness levels, and the lowest levels use much less power than the lowest selectable in the PictureBook. Lower brightnesses mean lower power drain, but they are not necessarily harder to read. Full marks to Toshiba on this count. The rest of the Power Management is not so well executed. "Cooling Method" can be varied along with the "Crusoe" power saving setting. On my Pentium machines I use a shareware utility called Rain.exe to control the CPU power drain. Switching it on and off only gives a computing difference of 0.6%. It is not clear to me why Transmeta's much heralded "Long Run" technology causes such a measurable performance hit. And you should always be able to use a laptop with maximum power saving enabled. Clearly that is not the case with the L1. Toshiba have tried to produce a sub-notebook that has none of the limitations previously inherent in this tiny form factor. This they have done very well. The Toshiba Libretto L1 will fit in your briefcase, and it will not be obtrusive. A very portable, adequately powerful, laptop computer.